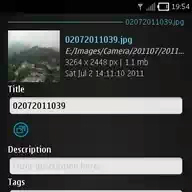 Qt based full featured Flickr client for Symbian smartphones FlickrUp updated to v2.1. The latest version brings new features, bug fixes and improvements to the client. Compatible with S^3 / Anna / Belle Smart Phones. Browse photostream, photosets, galleries, favorites, flickr’s recent, interestingness, contacts. All options that are provided by Flickr for UPLOAD. All upload options that are provided by Flickr are provided by this application, namely title, description, tags, privacy options, safety options, content-type & hiding options.